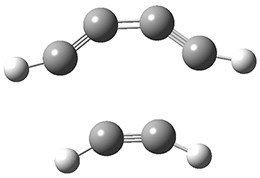 The weak n→π* interaction has been proposed to explain some conformational structure. 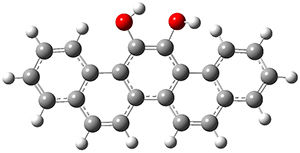 Singh, Mishra, Sharma, and Das have now provided the first spectroscopic evidence of this interactions.1 They examined the structure of phenylformate 1. This compound can exist as two conformational isomers, having the carbonyl oxygen pointing towards (cis) or away (trans) from the phenyl ring. 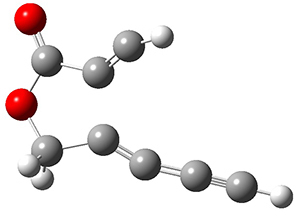 They optimized the structures of these two conformers at M05-2X/aug-cc-pVDZ and find that the cis isomer is lower in energy by 1.32 kcal mol-1. 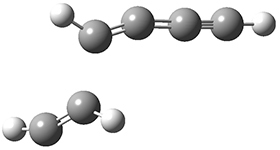 Unfortunately, the authors do not provide the structures of these isomers, but since they are so small, I reoptimized them at ωB97XD/6-311g(d) and they are displayed in Figure 1. At this computational level, the cis isomer is lower in enthalpy than the trans isomer by 1.35 kcal mol-1. Figure 1. ωB97XD/6-311g(d) optimized structures of the cis and trans conformations of 1. 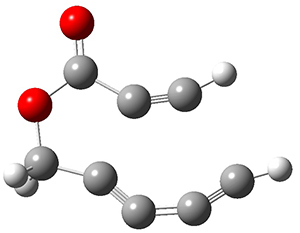 One-color resonant 2-photon ionization (1C-R2PI) spectroscopy followed by UV-VIS hole burning spectroscopy identified two isomers of 1, one present in greater amount that the other. The IR spectra of the dominant isomer showed a carbonyl stretch at 1766 cm-1, in nice agreement with the predicted frequency of 1cis (1770 cm-1). The carbonyl stretch for the minor isomer is at 1797 cm-1, again in nice agreement with the computed frequency for 1trans (1800 cm-1). The cis isomer has the lower carbonyl frequency due to partial donation of the carbonyl oxygen electrons to the π* orbital of the phenyl ring. (1) Singh, S. K.; Mishra, K. K.; Sharma, N.; Das, A. "Direct Spectroscopic Evidence for an n→π* Interaction," Angew. Chem. Int. Ed. 2016, 55, 7801-7805, DOI: 10.1002/anie.201511925. I have been posting regularly on this blog for over nine years, beginning in July 2007. I have used this blog as a way to keep my book Computational Organic Chemistry current for its readers. I have also used it as a way for me to keep current with the literature. It has been a terrific adventure for me, but an important change will be taking place in my life that will have an impact on the blog. Starting on August 1, 2016 I will become the Dean of the School of Science at Monmouth University in West Long Branch, NJ. (See the announcement.) I am extraordinarily excited to take on the challenges of leading the School. I suspect that my duties as Dean will keep me from finding the time to post as often as I have been for this past years. I will try to occasionally write a post as I intend to keep connected to the computational chemistry community. I have a few posts backlogged but expect a more infrequent posting schedule come August. I fully intend to maintain the blog so that past posts remain accessible. I want to thank all of the readers of this blog, those who read me through the Computational Chemistry Highlights blog, and especially those of you who have posted comments.